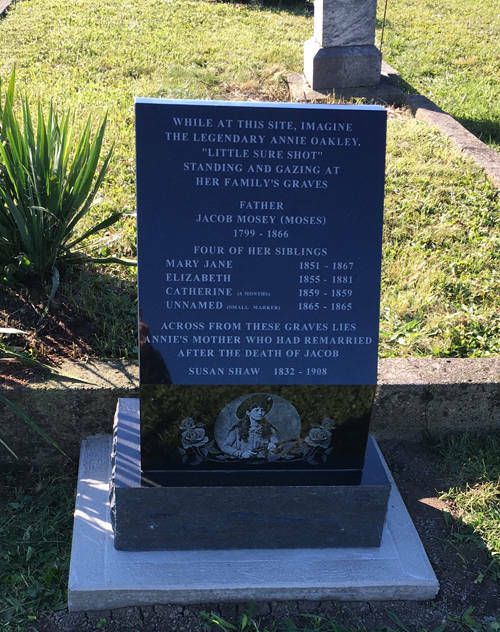 A new black granite marker at the Mendenhall Cemetery in Yorkshire features a photo of Annie Oakley and the listing of her father Jacob Moses, mother Susan Shaw and four of her siblings who are buried there. 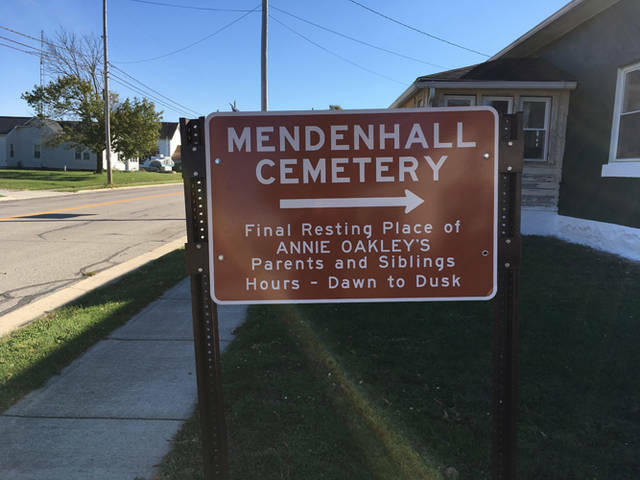 Yorkshire Mayor Ken Subler of along with the town council and trustees have installed a new sign at the entrance of Mendenhall Cemetery acknowledging Annie Oakley’s family. 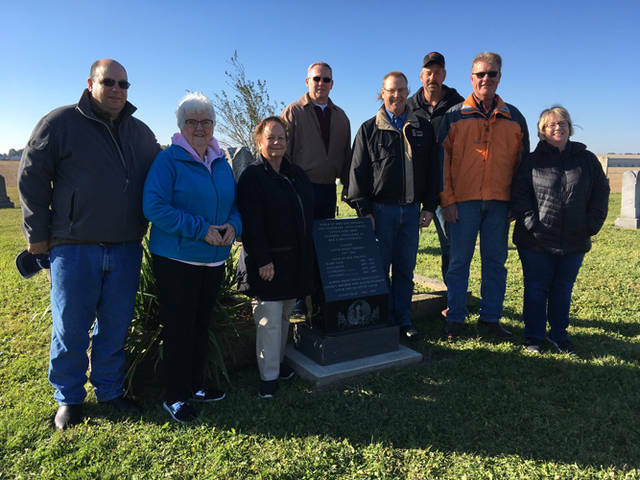 A dedication ceremony for the newest Annie Oakley historical marker at Mendenhall Cemetery occurred on Oct. 20. On the left of the stone are Jeff Perry, Joan Dowler and Bonnie Perry, Oakley’s relations. Perry also is a board member with the Annie Oakley Center Foundation. Behind the stone is Steve Meier, formerly of Yorkshire, and initiator of the idea. To the right of the stone are Yorkshire Mayor Ken Subler, Steve Puthoff and Sam Pohlman, two of the township trustees, and researcher Kathy Bruns. YORKSHIRE – An Annie Oakley historical marker was dedicated at Mendenhall Cemetery, where members of the famous sharpshooter are buried. “While at this spot, imagine the legendary Annie Oakley, ‘Little Sure Shot,’ standing and gazing at her family’s graves.” This is the beginning of the wording of a new black granite marker at the Mendenhall Cemetery in Yorkshire. The marker features a photo of Oakley and the listing of her father Jacob Moses (Mosey), mother Susan Shaw and four of her siblings who are buried there. Dowler added that she went with her mom and grandma many times. “Mendenhall Cemetery was important to her family,” she said. The originator of the idea, Steve Meier, thought Annie Oakley’s family’s cemetery plots needed to be recognized and this part of history of Yorkshire needed to be preserved. He, along with the Annie Oakley Center Foundation, donated the funds to pay for the stone, which Nickol Monument of Versailles donated at cost. Gary Condon at Nickol donated his time and labor for the inscription. Nickol Monument has been a part of all the historical markers designating Oakley’s birthplace and childhood home created in year’s past. Meier, with wife, Karen’s, support and encouragement, pursued his goal. Their friend, Kathy Bruns, began research online, beginning with the smallest stone marker besides her father’s grave. Meier then followed up with the Garst Museum Research Center on the accurate dates for each of the family graves. Wording was refined with the Annie Oakley Center Foundation and the Museum Director Clay Johnson. Township trustees Steve Hoelscher, Steve Puthoff and Sam Pohlman donated the site preparation and foundation work for the stone. And now, Yorkshire Mayor Ken Subler of along with the town council and trustees have installed a new sign at the entrance of the cemetery acknowledging Oakley’s family. The Mendenhall Cemetery will be added to the map at Garst Museum and The National Annie Oakley Center to direct visitors to the historical marker and locations related to Annie Oakley, including the newest marker at Mendenhall Cemetery. For further information on the Annie Oakley Center Foundation, see www.annieoakleycenterfoundation.com or the Facebook page.